AKIPRESS.COM - Scientists said Monday they have discovered the fossilized remains of a new horse-sized dinosaur that revealed how Tyrannosaurus rex (T. rex) became one of Earth's top predators about 70 to 80 million years ago, Xinhua reports. T. rex and its close relatives reached the top of their food chain at the end of the age of dinosaurs, after other groups of large meat-eating dinosaurs had gone extinct about 80 to 90 million years ago. But little was known about how these fearsome giants evolved from a family of small-bodied dinosaurs known as tyrannosaurs, largely due to a gap in the family's fossil record between 100 and 80 million years ago. Now, the newly discovered species – named Timurlengia euotica, which lived about 90 million years ago in today's Uzbekistan, seemed to help solve the mystery. Timurlengia, named after the 14th-century Central Asian ruler Timurleng, is a tyrannosaur but not the ancestor of the T. rex. 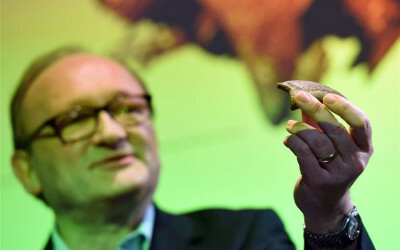 "We had this huge gap in the fossil record, about a 20-million-year gap," study author Hans Sues, chair of the Department of Paleobiology at the Smithsonian's National Museum of Natural History, said. "And this is an animal from the new tyrannosaurs from 90 million years ago in Central Asia, and it shows that at that point this animal had already evolved the complicated brain and advanced senses the T. rex had. But it was in a horse sized animal, and so obviously the brain reorganization happened long before these animals became real giants." Sues and a team of palaeontologists, led by Steve Brusatte at the University of Edinburgh, studied a collection of tyrannosaur fossils found between 1997 and 2006 in the Kyzylkum Desert, northern Uzbekistan, and discovered the new species. They found the species' skull was much smaller than that of T. rex, indicating that it did not grow to the same enormous size. However, key features of Timurlengia's skull like large inner ear revealed that it had developed keen senses and cognitive abilities, including the ability to hear low-frequency sounds. Timurlengia was about the size of a horse, and could weigh up to 250kg. It had long legs and a skull studded with sharp teeth, and was likely a fast runner, researchers said. The first tyrannosaurs lived around 170 million years ago and were only slightly larger than a human. However, by the late Cretaceous Period – around 100 million years later – tyrannosaurs had evolved into animals like T. rex and Albertosaurus, which could weigh more than seven tons. The fact that the new species was still small some 80 million years after tyrannosaurs first appeared indicated that T. rex developed huge body sizes rapidly at the very end of the group's evolutionary history, they said. "The ancestors of T. rex would have looked a whole lot like Timurlengia, a horse-sized hunter with a big brain and keen hearing that would put us to shame. Only after these ancestral tyrannosaurs evolved their clever brains and sharp senses did they grow into the colossal sizes of T. rex. Tyrannosaurs had to get smart before they got big," Brusatte said.